PHILADELPHIA – April 1, 2019 – Janney Montgomery Scott LLC, a leading full-service wealth management, financial services, and investment banking firm, today announced that the Fried Mouro Group, led by Financial Advisors Philip Fried and Robert Mouro, has joined the firm’s Raleigh, North Carolina branch office. They both join as First Vice President/Wealth Management, and were most recently affiliated with Merrill Lynch. “Philip and Robert are respected Financial Advisors recognized in the Cary and Raleigh, North Carolina communities for the comprehensive, high-touch financial guidance they provide their clients. We look forward to supporting them and their clients,” said Andy Kistler, Senior Vice President/Southeast Regional Manager. Mr. Fried began his career in the financial services industry in 1995. He holds the Certified Financial PlannerTM, Chartered Retirement Planning CounselorSM, and Certified Plan Fiduciary Advisor designations. He and his wife Maria live in Cary, North Carolina with their two daughters, Nicole and Valerie. Mr. Fried is active in his church, serving as a member of the Parish Council and the choir. He also volunteers for Dorcas Ministries, a local non-profit organization that provides assistance to individuals and families in need. Mr. Mouro began his career in financial services in 2002 after a successful 25-year career in the specialty chemicals industry. He holds the Certified Financial PlannerTM, Chartered Retirement Planning CounselorSM, and Certified Plan Fiduciary Advisor designations. 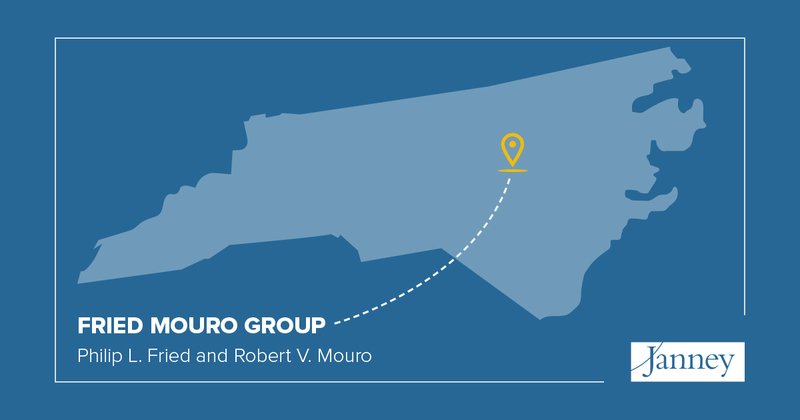 Mr. Mouro is the past chairman of the Morrisville Chamber of Commerce board and the past chairman of the N.C. Services for Dentistry board. He is currently the chairman of the advisory board for the Northwest Cary YMCA. He and his wife Jan have two sons, Steven, an OBGYN Resident at Vident (East Carolina School of Medicine), and Andrew, a fourth-year dental student at East Carolina School of Dental Medicine. Janney’s Raleigh Branch Office is located at 4140 Parklake Avenue, Glenlake One, Suite 300, Raleigh, NC 27612.